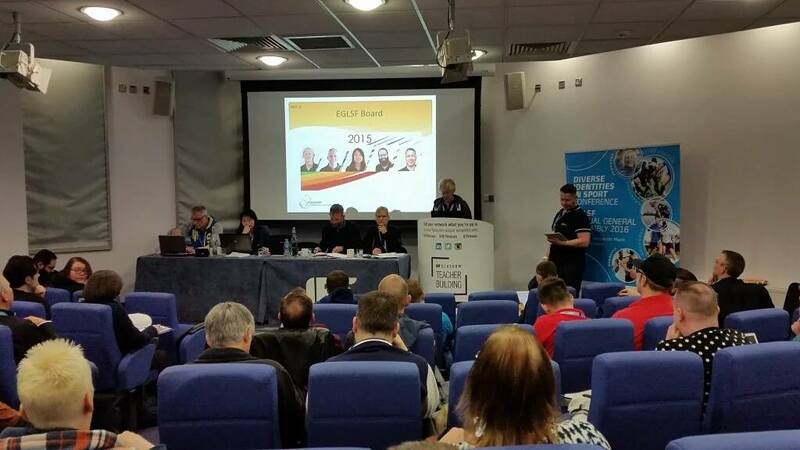 For the first time in its 28 year history, the European Gay and Lesbian Sports Federation (EGLSF) congregated in Scotland for its annual full members meeting. As well as a one day conference and the two day Assembly, delegates were welcomed to Glasgow by Baillie Razaq at a Civic Ceremony at Glasgow City Chambers, treated to entertainment by some local performers at a Culture Lounge at Strathclyde Student Union, and had a social dinner at the National Piping Centre where some tried playing the pipes and ceilidh dancing. Speaking on behalf of the EGLSF board, John Ryan said “The European Gay & Lesbian Sport Federation would like to thank Leap Sports Scotland for their outstanding hard work and dedication during the Diversities in Sports Conference and for hosting our Annual General Assembly. Our three days in Glasgow proved to be an incredible learning experience. The conference highlighted the general lack of awareness of the issues that transgender people face in sport but we have left with the tools to face these challenges. The EGLSF is determined to highlight these issues with our members so we can all be more informed about the struggles our community faces”. Delegates also voted to take next year’s Assembly to Dusseldorf, and there was a handover between the two organising groups. The Assembly has been to Germany on 7 previous occasions, but this will be the first time it has been hosted in Dusseldorf. The EGLSF committee awarded LEAP Sports Scotland an award for outstanding contribution to European sport as the weekend drew to a close. Written on 10th March 2016.